I’m keen to record what happens whilst I’m settling into Cardiff life so joining in The Guardian’s 52 weeks photography project (‘join our photo project to share your 2012 in pictures’) seemed like the perfect way of doing it. A photo a week seems do-able, more so than a lengthier blog post or photo a day (with 365 Days), with which I could imagine myself lapsing with. The project features a fair bit of ‘iphoneography’ but my first image was taken with my trusty Canon G12 after I’d tried and failed to capture the image in the failing light with my iphone. I took the photo last Thursday evening. 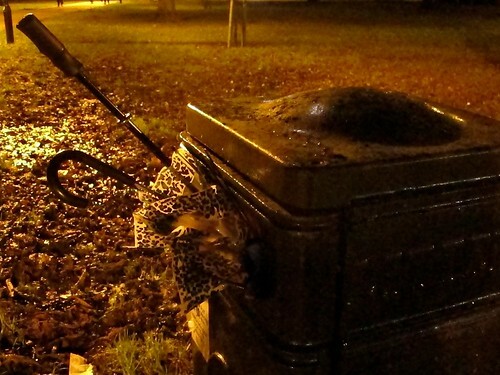 After having had my brolly blown inside out and getting soaked as a result early that morning, this bin with broken brollies sticking out of it in Bute Park seemed to say it all about the stormy weather. The weather wasn’t the only unusual thing – being in Bute Park after dark also felt like quite a novelty. Bute Park traditionally closed its gates at dusk, forcing commuters to walk or cycle around rather than through the park after dark. But over October-December Cardiff Council held a three-month pilot where they opened the major routes until 7pm to allow cyclists and walkers to use them for their journeys home from work. I’m unsure what the results of the pilot were – the routes seem to have been well-used after dark. But the gates have remained open until 7pm after new year, so the pilot seems to have been extended at least. I’m keeping my fingers crossed that it becomes a permanent arrangement, as the walk/cycle from Pontcanna to central Cardiff via Bute Park is a particularly pleasant experience. I’ve not taken my second week’s photo yet, I’m hoping inspiration strikes me soon! 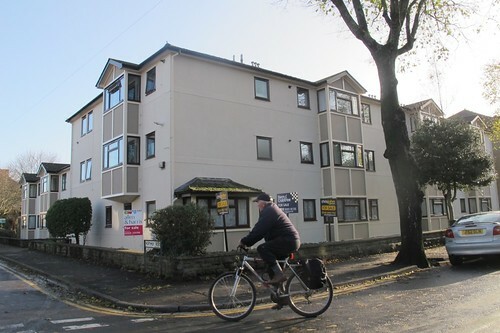 Pontcanna saw the new year in with a new hyperlocal website – PontcannaHub.com was launched on 1st January by the Pontcanna Pine/Dairy Team. As well as ‘an information website for people who like, live, visit & work in Pontcanna’ it also supports the local campaign against the proposed developments of a Sainsbury’s and Tesco supermarket. Now I’m not anti Tesco or Sainsbury’s per se – I can see that in some places, a local chain supermarket might not be a bad thing. I remember being delighted to hear (unfounded) rumours of a Digbeth Tesco Metro shortly after I moved there in 2007 because the area had so little in the way of local shops and amenities at that time. But Pontcanna is a very different place to Digbeth – a big part of its identity is its many local independent shops, cafes and bars. Since moving here I’ve found myself doing my food shopping at the local butcher’s, baker’s, greengrocer’s and deli rather than getting the lot under the one roof and I and a lot of other local residents seem to prefer it that way. That and a fair few other reasons (local parking and housing issues) is why quite a few of us will be heading to St Catherine’s Church Hall on Kings Road this Thursday evening to discuss Sainsbury’s proposal. As anyone following on me on twitter will be aware, the last month has been an eventful one for Carl and I. It started off with Carl getting a fantastic new job at Cardiff University. We’d taken the decision to move to Cardiff a few months ago for a variety of reasons – so I could get closer to my family, to embark on a new adventure together, to begin a fresh chapter in our lives. We weren’t expecting this move to happen quite so soon, however – Carl spotted the perfect job, went for it and suddenly we had just over a month to relocate. But before we had time to start packing and go house-hunting I went into hospital for a minor operation, which resulted in a surprise diagnosis of edometriosis and two weeks in a weird, post-operative fog. Time and nerves have been kind of tight, but we seem to be getting there and are hoping to move into a new place in Pontcanna, Cardiff very soon. But that’s not the place in the above picture. That place is a block of flats just a little further down the same road that stands where an old house once was, in which my parents and brother lived until 1976, when Mum discovered she was pregnant with me and the family moved to a larger home. This big rush to get ourselves sorted means we’ve no real time to say a proper goodbye to Birmingham, which I want to do. After living here for almost 15 years, I’ll miss the place and the people like crazy and the prospect of leaving is as scary as it is exciting. We’ll be back to visit lots, of course but I’m hoping the first trip back will be for a last Brummie birthday in January. 1. What will happen to Digbeth is Good? This will continue to stay in the very safe hands of Pamela, secretary of Digbeth Residents’ Association, who’s been blogging on there more than me of late. Midge will still be posting his music-related updates and I’ll chip in from afar when I can. Obviously, the more the merrier so if you’d like to contribute to Digbeth is Good, either regularly or just for a one-off post, let me know! 2. Will you be starting a hyperlocal blog for Pontcanna? I’ll never say never, but it’s definitely not something I’ll be doing straight away. Let me get moved in and settled down and we shall see what we shall see. I am looking forward to getting involved in local life – Pontcanna residents seem like a pretty well organised bunch. My new home is also very close to Chapter Arts Centre, which hosts Canton Social Media Surgeries, so I intend on being a familiar face at those! 3. What will you do for work? Very pleased to say that I will continue working for Talk About Local from Cardiff.